Michael Thurmond’s 6 Week Body Makeover is a method of losing weight and reshaping the body in a relatively short period of time. The 6 week body makeover was developed over a number of years by fitness expert Michael Thurmond, a member of the ‘Extreme Team’ on the Extreme Makeover television series. The 6 week body makeover is not a diet involving special meals, drinks or pills. Rather it is a customized process of learning your own reaction to particular foods, then combining them in your diet so that your unique metabolism burns more fat. This together with the exercise program which is part of the purchased package, is claimed to ‘make over’ the body to achieve the desired result in 6 weeks. 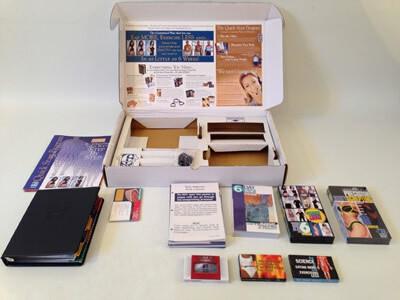 The package comprises a kit which includes a starting-up video, a body ‘blueprinting’ Kit, exercise bands & training video, custom eating & body shaping plans, a guide for dining out, a ‘Living Lean’ program & audio cassette, a recipe guide/menu planner, and possibly a bonus 6 Day Mini Makeover (see below). It is sold via an infomercial format and is priced at more than $170. Identify your type of metabolism by filling out a questionnaire, and reprogram it for maximum fat burning. cause weight-loss while reducing foods that cause you weight-gain. Determine your body type, its unique problem areas, and your ultimate goal, in order to exercise less (18 minutes twice a week is quoted) and reshape your body in as little as 6 weeks, losing up to 30 pounds in that time. Learn how to keep excess weight off after the makeover is complete. The 6 Week Body Make over program (6WBMO) provides you with an eating plan for each meal, tailored for your metabolism, such that you will lose up to 30 pounds in 6 weeks. It details how to use the right foods, combinations, and amounts at the right time of day to force your metabolism to run faster, burning more of the food you feed it as fuel and storing less as fat, thus automatically losing body weight. Anyone taking medication or with special medical conditions should consult a physician or health care specialist before undertaking this aggressive weight loss plan. There is dietary advice in the plan for participants who suffer from hypoglycemia, high or low blood pressure, or food allergies. with time, you don’t miss the salt. I found I acquired a taste for the fruits/ veggies. there is no dairy and lots of healthy foods & water. In the 1st 6 wks I lost 30+ lbs. The 1st wk was the hardest, because the plan is so strict. I am on my 17th week and I have lost 68.5 lbs. Yes it takes time to prepare your food for the week … I cook the week’s meals on Sundays. time at all in the kitchen. I am in my sixth day and I have lost 8.5 lb. I started the 6WBMO almost 5 weeks ago … I have lost 17 pounds. The 6 Week Body Makeover is undoubtedly a program that works for many who stick to the regimen. Others feel that it is over-priced for the information that is offered. The much more rigorous 6 day mini makeover or ‘mini makeover’ has been developed from the basic 6 week body makeover outlined above. This accelerated weight loss plan is designed to drop the body to a smaller clothing size in 6 days, so it is suitable as a crash project for a special occasion, but is NOT recommended for use on a regular basis. The 6 day body makeover involves 5-6 small meals per day, and 45-60 minutes daily of ‘long, slow distance exercises’ (walking, slow jogging, treadmill, or stationary bike), which it is claimed shifts the body into fat-burning mode. Much planning and preparation is required, but menus and serving sizes are all mapped out, and recipes are provided. A lot of fish and poultry are on the menu and are including in mid-morning and afternoon snacks. I can’t remember if Mayonnaise and Mustard where allowed to have. Can anyone one help with this question? I loved this program. I still have it and plan to go right back on it. I went down from 278 to 220 lbs and kept most of it off for a couple of years. I am getting ready to start this program again also. I lost 100 lbs the first time I did it and I have approximately that much to lose again. I do not believe mayo was aloud unless you made it yourself. Not unless it’s sugar free. I did this program back in 2008 and went from about 260 to about 180. I am now yo-yoing between 195 and 200. I turn 50 in June and I would like to be down to 150 to 160 range before them. You guessed it I am getting this back out and getting back on it. No quick weight loss schemes. Only the tried and true right way to do it. If you do it right it will stay off. Ann that’s sounds positive! Keep up the good work. I am going to do all of it and add 10 jumping jacks, 10 squats, 10 push ups, 10 crushes, 10 bicycle sit ups 3 Xs a week, 3 days a week. I also have it but I also saw it on pinterest. Take a read, I mean a REAL GOOD READ! It screams PORTION CONTROL all over it. wow and i didn’t charge you 150.00 to tell you that!! It’s WAY more than portion control. It’s proper exercise without KILLING yourself!! Toning where you want to tone and getting that metabolism going to really kick it in high gear. I work with so many people that are on fad programs at the moment and thrilled when they lose 5lbs in a month. I’m 2 weeks in and have dropped 11lbs!! I’ve definitely gotten their attention. One has asked just exactly what am I doing that she isn’t. Sorry I have to agree with Tracy. It WAY WAY more than portion control. This program is better than anything I have ever tried and I have tried a lot of things over the years. Including weight watchers. I am so glad I kept my kit all these years. My husband was going to throw it in the trash but I took it and tucked it back in the closet. Will be starting again today. It was an easy decision once I made up my mind.